No Way Jose VS Velveteen Dream; Velveteen Dream wins. 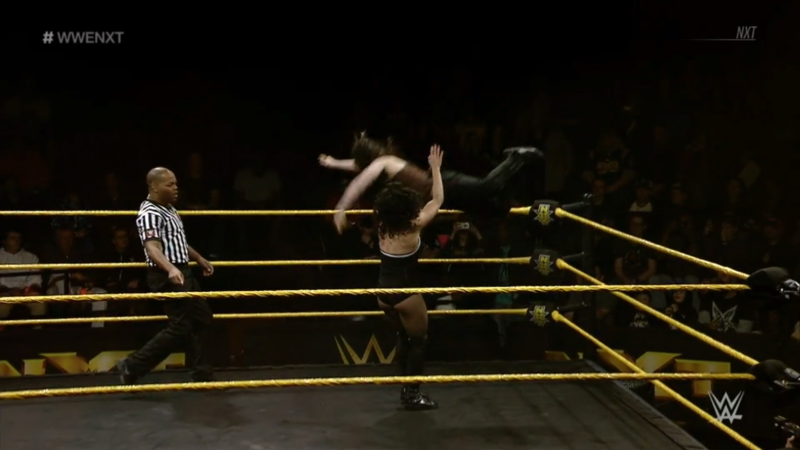 Vanessa Borne VS Nikki Cross; Nikki wins. 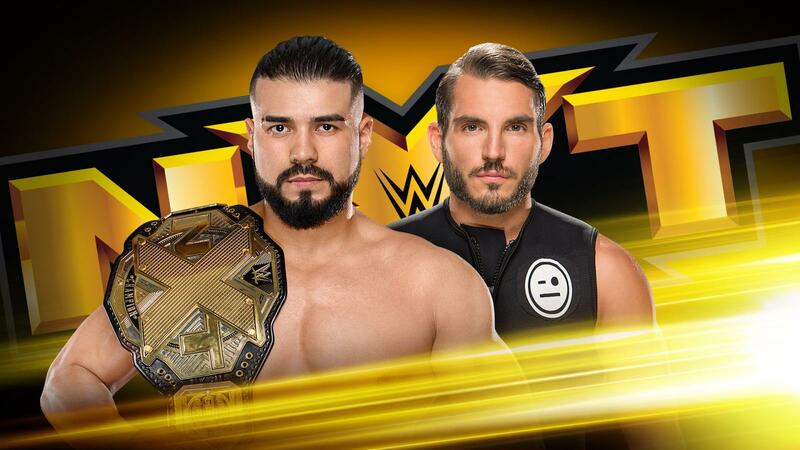 NXT Championship VS NXT Career: Andrade “Cien” Almas w/ Zelina Vega VS Johnny Gargano w/ Candice LaRae; Almas wins and retains the NXT Championship, Gargano must leave NXT. 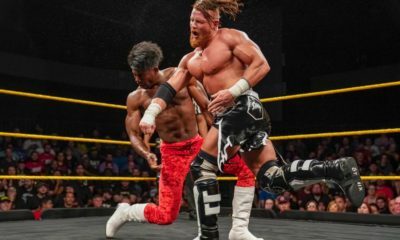 NXT takes a look at the build to tonight’s main event. 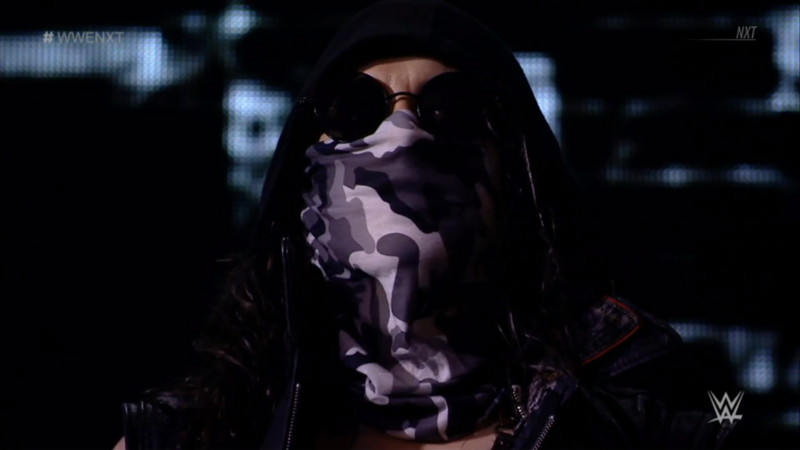 La Sombra became El Idolo. But then El Idolo got stuck being a party boy. Zelina Vega came, and changed all that for him. Now El Idolo is El Campeon, and Vega knew it was going to happen all along. “You are all witnesses to a historic championship reign!” Johnny Freakin’ Wrestling tried, but failed. However, he–and even Mrs. Wrestling–have gotten on Vega’s nerves. Gargano wants one more shot, and Almas gives it, on the condition that if Gargano loses again, he’s GONE from NXT! Johnny accepted, because if he can’t be champion, he has no reason to be here. Can he do it when it is Do or Die in NXT!? No Way Jose VS Velveteen Dream! 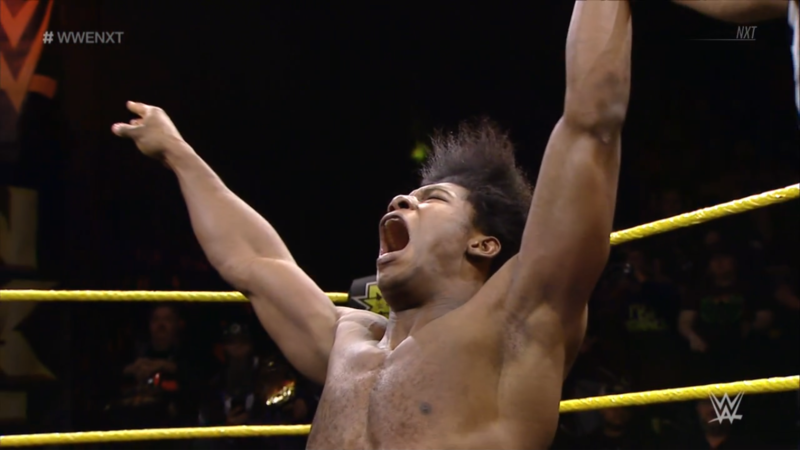 The Patrick Clark Experience wants everyone to know he’s worthy of the spotlight, and he’ll start with showing the Fighting Fiesta that light in person. Will the party be spoiled when a dream is over? Dream shows off just taking his shirt off, and the fans chant, “Velveteen! Velveteen!” Jose shows off some of his own swagger as he takes his shirt off. The bell rings and the two dance while they circle. They tie up, Dream knees low and rocks Jose with European uppercuts. He then hammers in forearms, but the ref backs him off. Dream poses and swivels his hips to get those tassels moving. However, Jose returns and clobbers Dream from behind. Jose keeps it up and backs Dream to a corner with a chop. He whips Dream corner to corner but Dream elbows him back. Dream hops up but flies into double ax handles! Jose rallies and body drops Dream. Jose baits Dream and dumps him outside! He then builds speed, and baseball slides to drop Dream off the apron. Then Jose slingshots over to splash onto Dream! Dream is in trouble but the party is rolling while we go to break. NXT returns with Jose putting Dream in the ring. Dream kicks back as Jose reenters, and Jose is staggered. He turns around, Dream picks him up and hotshots him on the top rope to then give him a neckbreaker! Dream hurries to a corner, jumps, but into boots! Small package, TWO! Jose and Dream get up, Jose blocks punches to counter with haymakers. He backs Dream to a corner then biels him out! Jose runs in for a forearm smash, then unloads body shots and stomps. Another biel and Jose keeps up the attack. Jose throws Dream a third time and right into buckles. The fans duel while Jose winds up, pop-up but dropkick from Dream! Dream drags Jose up, fireman’s carry for the rolling Death Valley! He climbs up again, takes aim, and leaps for the Purple Rain Maker! Dream wins! The party is over, and so is the dream. Can the Experience make his way towards that NXT Championship? 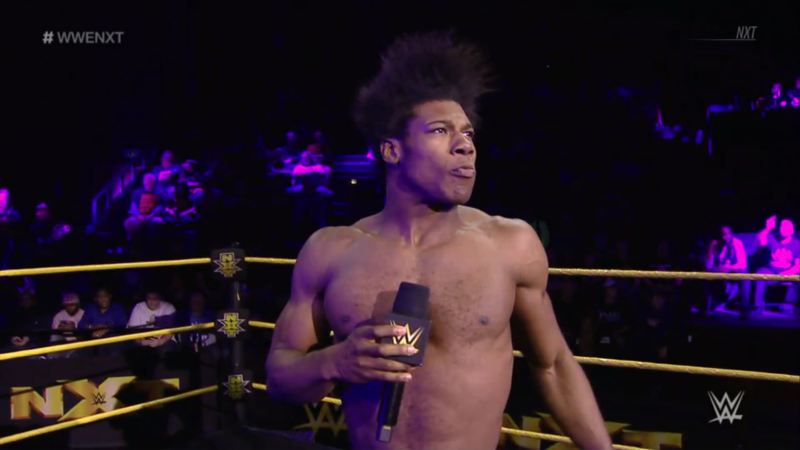 The fans chant for “Velveteen!” but he wishes to reassign the NXT End of the Year Awards. 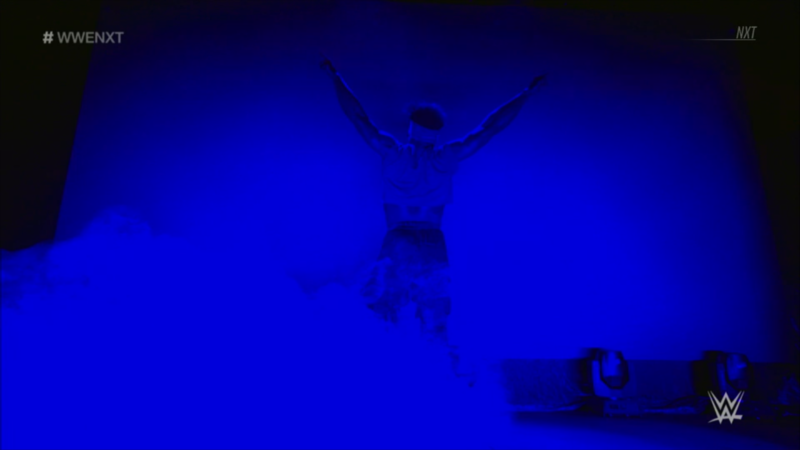 Male Competitor of the Year, Overall Competitor of the Year, MATCH of the Year: Velveteen Dream! Aleister Black, Asuka, Tyler Bate? No one cares about them. Velveteen’s name is what’s on the tip of everyone’s tongue. The fans chant “Velveteen! Dream!” “And if you can’t see that, then I just don’t have time for ya.” The Experience is the enigmatic mix of charisma, confidence and skill, will the dream continue to be over? 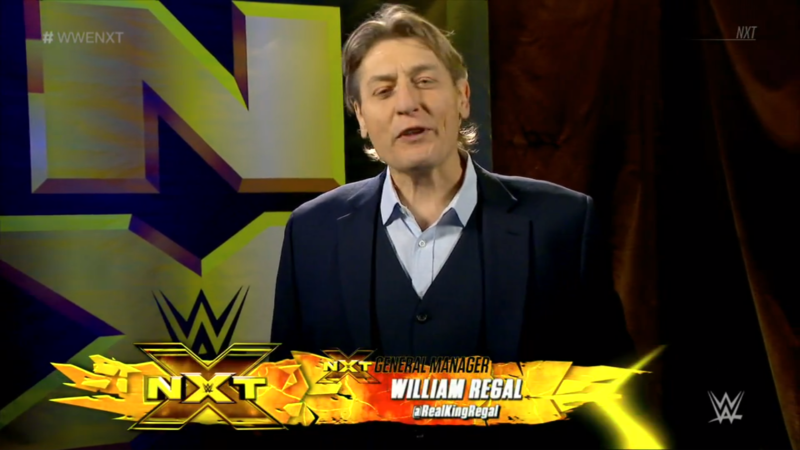 NXT General Manager, William Regal, makes an announcement. 2018 is already a great year for the Tag Team Division. Therefore, the Dusty Rhodes Classic will be returning in two weeks. The tournament not only honors the memory of the American Dream, but the winners will automatically challenge for the NXT Tag Team Championships at TakeOver: New Orleans. He wishes luck to everyone entering. 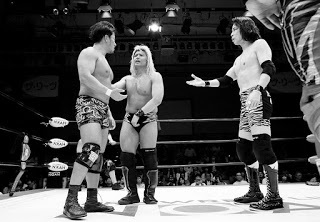 Who out of the stacked tag team division will rise up and “shoot for the sky”? Vanessa Borne VS Nikki Cross! The NXT Women’s Division is also incredibly competitive, and every woman wants to be the best. Can Vivacious Vanessa overcome the Loony Lass of SAnitY? The fans are already fired up for Nikki, and Nikki is always fired up even before the bell. The bell rings, and she unleashes that fire on Vanessa! She puts Vanessa in a corner for furious stomps, then backs off to drag Vanessa out. Vanessa counters the whip, but Nikki comes back around to get a thrashing sleeper hold wrapped on. Nikki adds body scissors, but Vanessa still snapmares her off. 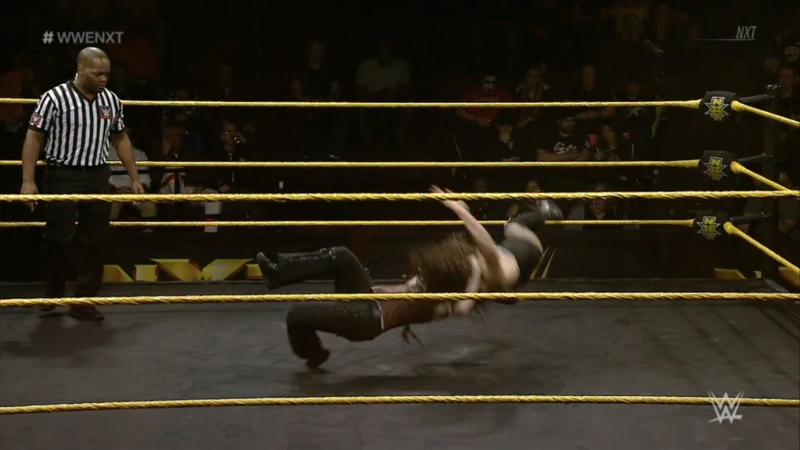 Nikki gets up with a grin, but her kick is blocked, Vanessa brings her into a spinning side slam! Cover, TWO, but Vanessa tries again. TWO, and Vanessa is frustrated while Nikki just grins. Vanessa stomps Nikki at the ropes, letting up at 4. HOwever, she comse back to choke Nikki on the ropes. She lets up agani, then yanks Nikki off the ropes. Vanessa snap suplexes then floats to a mounted cover, TWO. Nikki resists the half straitjacket but Vanessa still puts it on. The fans rally and Nikki gets up, only for Vanessa to throw her down by her hair. Nikki still grins, even as Vanessa pushes her around. It scares Vanessa, and Nikki tackles her with a crossbody! Nikki thrashes her some more, then rallies with forearm smashes. Nikki puts Vanessa in the corner, fires up, then runs in for a big corner splash. Vanessa staggesr away while Nikki climbs up, flying crossbody! No cover, but Nikki doesn’t slow down. She roars and beats her chest, then drags Vanessa up. Fisherman Neckbreaker, aka the Purge! Nikki wins! Unhinged and unpredictable, can Nikki prove unstoppable on her path to the NXT Women’s Championship? NXT looks back to the encounter of Killian Dain & Aleister Black. The Embodiment of the End has a devil driving him, “because that devil is the NXT Championship.” Aleister wants that title, but so does SAnitY’s Beast of Belfast. Damo vows not to stop until the NXT Championship is around HIS waist. He warns Aleister that his path “will be stopped by chaos.” But Aleister pointed out that Damo crossed him, so now Damo must #FadetoBlack. Which man will run the other off the Road to Wrestlemania to chase that championship? NXT looks back at last week’s Women’s Championship match. When the Queen of Spades wouldn’t let up on Ember Moon’s arm, the Pirate Princess made her triumphant return! Kairi Sane knocked down and ran off Shayna Baszler before she could do more damage to Ember. Now to settle things, NXT will grant a rematch from the Mae Young Classic finals! Will Kairi win again? Or will Shayna even the score to continue her pursuit of the title? NXT Championship VS NXT Career: Andrade “Cien” Almas w/ Zelina Vega VS Johnny Gargano w/ Candice LaRae! This is it for Johnny Wrestling: win or leave! He’s already 0-3 against El Idolo, some of that because of La Gerente’s direct interference, but he still has his confidence. 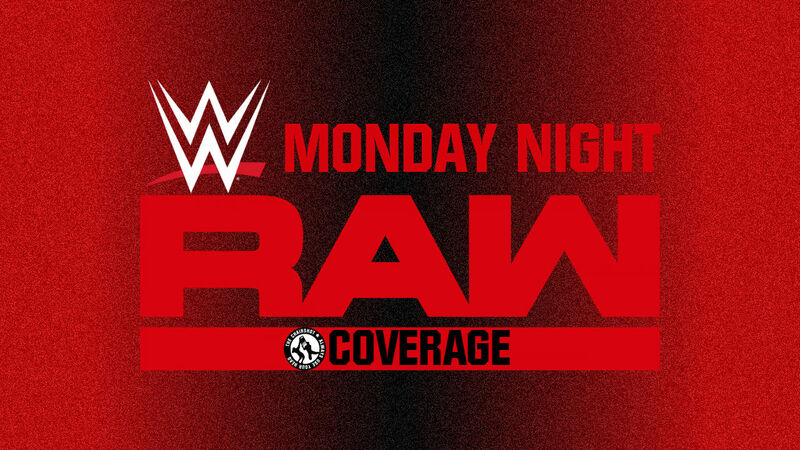 Is the pressure of being backed against the wall–and having MRS. Wrestling by his side–going to be enough for Gargano to finally win the big one? The bell rings and the two circle. They tie up, Almas rolls Gargano but not even a count before Gargano kicks out. Almas keeps close and rolls him again, ONE, but Almas waistlocks and rolls Gargano back again, ONE! Gargano avoids the Hammerlock DDT and slips out of the ring. The fans applaud while Almas dusts himself off. Candice regroups with her husband while we go to break. NXT returns to Almas and Gargano tying up again. Gargano gets a waistlock and Almas tries to find a way out. When he can’t pry his way out, Almas hits Gargano with a stiff back elbow. Almas thrusts in a knee, then stalks Gargano to a corner. He whips Gargano corner to corner but Gargano goes up and over to then roll away. Almas runs out but Gargano shoves him to a corner for the step-up enziguri! Then Gargano begins to rally with ax handles and a dropkick. He clotheslines Almas all the way out, and then fires up with the fans. Gargano builds speed, but Vega stands in his way, canceling the flight. Candice won’t stand by and watch, she gets in and she DIVES! While Mrs. Wrestling takes the fight to Vega, Gargano slips to the outside to hit Almas with a cannonball! Candice chases Vega up the stairs and catches her at the stage. She doesn’t let up on Vega for a second, and the fans chant “NXT! NXT!” in appreciation of it. Vega scurries away and Candice gives chase, leaving Gargano and Almas to the match. Gargano haymakers Almas back into the ring, but Almas sees the slingshot coming and disrupts it. They both go to the apron, and Almas drags Gargano up. He hits the dragon sleeper backbreaker and then the elbow drop DDT onto the apron! He puts Gargano back in the ring, covers, TWO! Almas keeps his cool while the fans duel with chants, “Johnny Wrestling!” “An-dra-de!” Gargano revives and chops Almas. Almas shoves Gargano, Gargano comes back to throw Almas at the ropes, but Almas tumbles to the apron. Gargano walks over, Almas catches him in the draping armbar! He pulls that arm, but the referee counts. Almas lets go at 4, then takes his time returning. He rains down right forearms, then drags Gargano up. Almas wrenches the arm into a hammerlock then throws Gargano shoulder first into buckles. He stomps away on Gargano at the ropes, then walks off his frustration. Almas loops the arm around the ropes to wrench it more, but the fans rally for Gargano. The fans duel again as Almas roughs Gargano up. Almas whips Gargano corner to corner, then runs in, and blocks the boots. He spins Gargano around, dragon sleeper for a draping backbreaker and elbow drop DDT! Cover, TWO! Almas walks off his frustrations but he’s still in control while we go to another break. 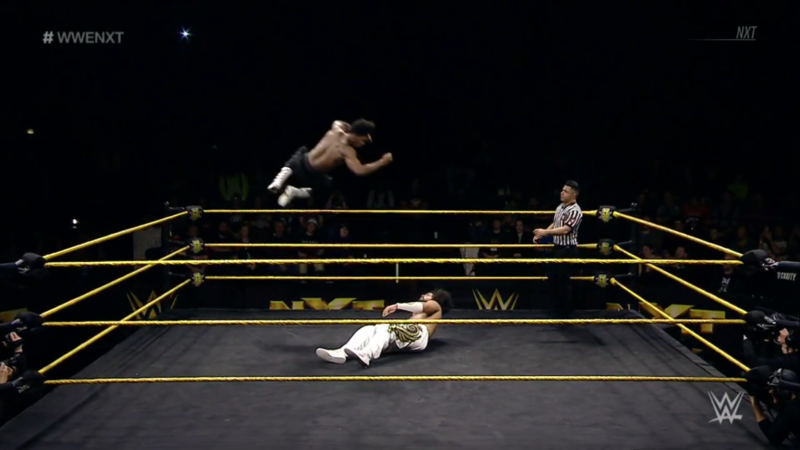 NXT returns to Almas wrenching Gargano’s arm on the mat while fans rally for Gargano. Gargano gets up and to his feet, but Almas knees in low. 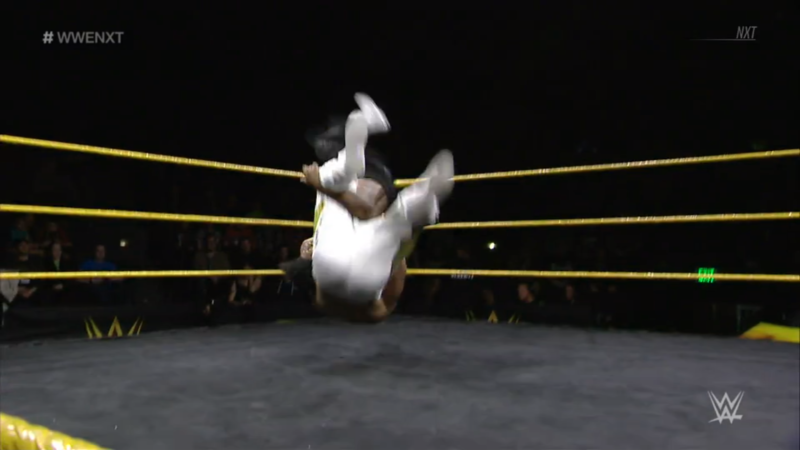 Almas suplexes but Gargano slips out to roll and kick Almas! Gargano runs and chops Almas in a corner, but Almas reverses the corner to corner whip. Almas runs in, Gargano boots him away this time. 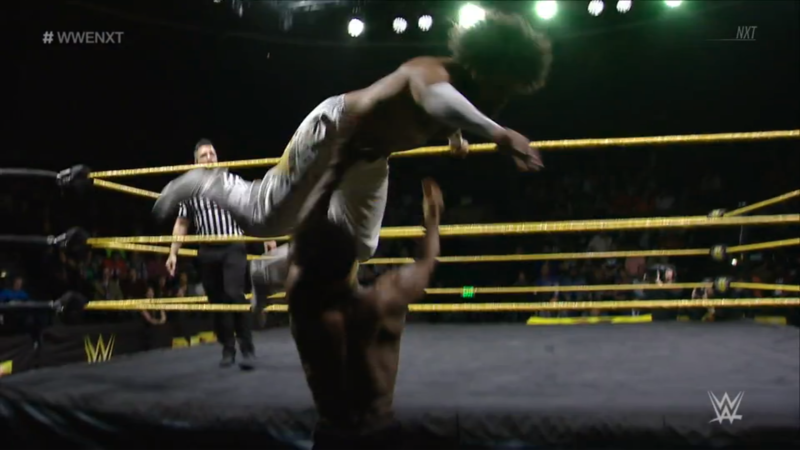 Gargano hops up and hits a flying headscissors to send Almas out of the ring. He walks over and slingshots, but Almas slides in under him. Almas runs at Gargano, but Gargano slingshot spears him down! Cover, TWO! Gargano keeps focus, he knows he’s getting close. The fans rally while he gets feeling in that bad arm. He brings Almas up and throws forearms frmo both sides. Almas responds with forearms of his own, but then Gargano forearms him back. Gargano mule kicks a leg out, then takes aim from a corner, but Almas evades his second kick to roll him up! TWO, but Almas keeps going with the deadlift buckle bomb! Gargano is down, Almas goes corner to corner and back again, for CIEN KNEES! Drag to a cover, TWO! Almas can’t believe it, even after the fortitude Gargano showed back at TakeOver: Philadelphia. The fans rally for Gargano while Almas prepares the Hammerlock DDT, but Gargano powers him to a corner. Almas holds on so Gargano rams him in again, but the third time, Almas uses it to throw Gargano into the post! The referee checks on Gargano while Almas slips out to the apron. Speaking of Philadelphia, Almas runs in but his knees are countered with a SUPERKICK! They both slump against the ropes but the fans fire up again. Almas and Gargano strike back and forth with haymakers and chops. Gargano even uses his bad left arm to punch Almas. He then sees their position, and gets an idea. Gargano lifts Almas in the fireman’s carry, but Almas fights out and ends up in the ring. Gargano slingshots in again, but the spear is countered into the Fujiwara armbar! Almas wrenches and Gargano endures! Gargano reaches for ropes, but rolls instead. Almas keeps on it, then reaches around to steal the GargaNo Escape!! Gargano rolls Almas, TWO! Almas swings in, Gargano catches that arm. When he can’t get his own hold, Gargano decides to steal the Hammerlock DDT! But Almas stops that, and rolls Gargano in the small package. Gargano rolls it back, then they teeter on a double cover, double TWO! They both swing clotheslines and solidly collide. They go again and again both collide with clotheslines. Gargano runs out, but into a hip toss that sends him into buckles! Almas sees his chance, and runs corner to corner, for Cien Knees to the back of the head! He drags Gargano for the cover, TWO!! It’s like TakeOver: Philadelphia all over again! The fans rally for Gargano while Almas’ frustration grows. Almas stands up and works on a plan. He drags Gargano up and hoists him to the top rope. Almas drapes Gargano up there with the hammerlock, but Gargano resists. They brawl, Gargano backs Almas down with a headbutt. Gargano adjusts but Almas trips him up. Almas rocks Gargano with a forearm before he climbs up top. Gargano slips out and around and shoves Almas down! Almas hits the floor, then Gargano runs, and DIVES for the tornado DDT! He hurries to get Almas back in the ring. Gargano wants Almas to get back up, and when Almas does, he slingshots in for another DDT! Cover, TWO!! Gargano can’t believe he still hasn’t won this yet. The fans cheer and rally as Gargano slowly brings himself around. He drags Almas up to punch him back down. He goes again but Almas hits back. Gargano punches, then Almas forearms, they brawl on their knees. Almas swings big haymakers but Gargano responds with forearms from both sides. Gargano backs up and gets a chop, so he SUPERKICKS Almas back. Then Gargano hops up, but Almas pushes him off. Almas swings the back elbow, but Gargano ducks and so the ref takes the hit! Even so, Gargano tilt-o-whirls and, after some struggling, gets his GargaNo Escape!! Almas endures, reaches, but then from out of nowhere, it’s CIAMPA!! 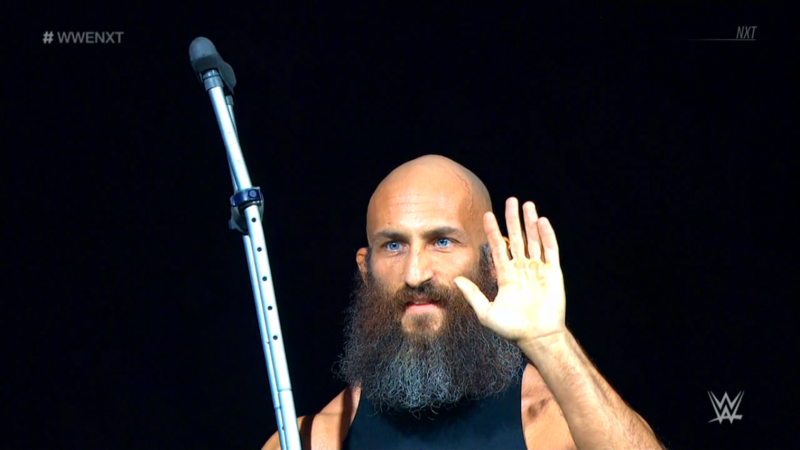 Tommaso Ciampa returns, armed with his crutch! And with the referee down for the count, he SMACKS Gargano with that crutch! Another flashback to TakeOver: Philadelphia. The Sicilian Psycho slips away into the shadows, and Almas picks the carcass with the Hammerlock DDT!! The referee only now regains consciousness, and counts the cover. Almas WINS! He goes 4-0 against Gargano, retains the title, but worst of all, he banishes Gargano from NXT. Vega returns to celebrate, likely unaware of the real reason why Almas won again. All that aside, is Ciampa still not through ruining Gargano’s life? The fans still chant, “Thank You, Johnny!” in appreciation for all the blood, sweat and tears he shed for them. Candice also returns, to console Mr. Wrestling as the official announcement is made. The fans refuse, they chant, “No! 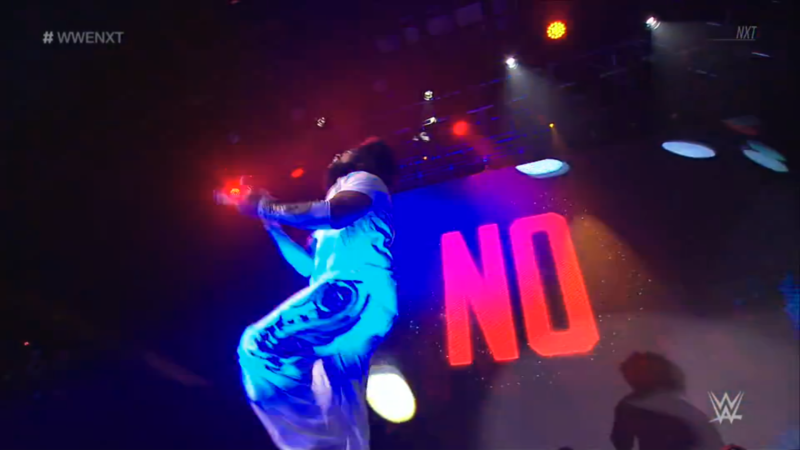 No!” But Gargano accepted the terms, and must keep his word. The fans applaud as he and Candice stand back up. They again chant, “Thank you, Johnny!” while Mr. & Mrs. Wrestling head up the steps. Gargano looks out at the NXT Universe one last time from the stage. Ciampa returns from his hiding spot to mockingly wave good-bye to his former friend. Will Gargano leaving NXT be the end of the Psycho’s grudge against him? Or is it just the beginning of a new chapter for them both? This was a pretty great episode that was straight to the point from start to finish. Dream-Jose was pretty quick, even with the ad break added in. Dream goes over to build him up more, and his promo after was also pretty great. He name-drops the winners of awards, but he’s already lost once to Aleister and can’t compete against Asuka whether or not she is on main roster or NXT. The build is clearly for Dream VS Bate at some point, which will be a great match, but I have no idea who will go over given how talented both men are. Great to hear the Dusty Rhodes Tag Team Classsic is coming around again, and Mauro name-dropped some teams that have the potential to win. 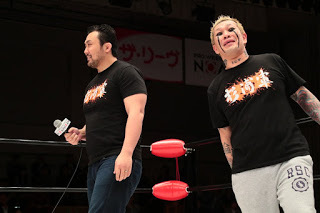 My choice will be TM61, and perhaps in a match where they overcome the Authors of Pain in return for last year’s loss. Then TM61 VS reDRagon can happen Wrestlemania Weekend for some great action and another toss-up decision. Then Nikki Cross VS Vanessa Borne was another short but fun match. No offense to Vanessa, but she wasn’t going to win that one. Nikki stays strong while she waits for either another go at the NXT Women’s Championship, or a feud with the Lady of NXT, Lacey Evans, per Evans’ mission of straightening out the Women’s Division. Then that amazing, amazing, amazing main event. It was on par with the TakeOver version of this Almas-Gargano feud, right down to Vega and Candice scrapping and running off to the backstage area. And then, at the very climax, at the very moment we think Gargano will pull off the miracle, Ciampa comes out to kill it all. Their feud won’t need a title to decide who is better, just the win(s). With Gargano leaving NXT, expect him to go to 205 Live/Raw. He won’t have a spot in the Cruiserweight Championship tournament, but again, he and Ciampa only need each other in this feud. 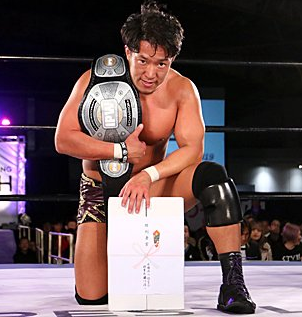 They had a great match in the Cruiserweight Classic as friends, them having a match as enemies will go above and beyond even that. Then after the dust settles and there is a winner, that man can challenge the winner of the Crusierweight Championship tournament in the days after ‘Mania.